When your kids are driving you mad, your house is a mess, and your work deadlines are piling up, make this recipe. If the tasty, sorta-healthy treat doesn’t cheer you up, squeezing the cherries will. Something about squeezing the juice from ripe (or thawed) cherries is intensely gratifying–kind of how I imagine kids used to feel while stomping on grapes barefoot in Italy. But don’t let your kids take this job. Go ahead, let the cherry juice drip all over you. Mash the cherries with your bare hands or a fork if your finicky. Drain the juice and drink it (yum!). 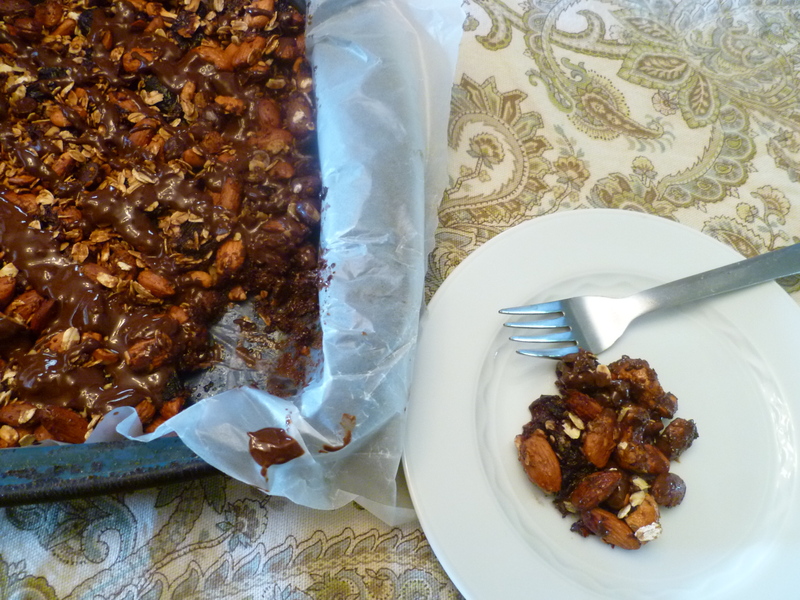 Mix in the chopped nuts, oats and chocolate chips. Combine the flax and honey or agave in a bowl and then pour over the cherry mixture. Bake at 350 for 30 minutes. Let cool. Melt the 1/2 cup chocolate chips and coconut oil in the microwave or double boiler. Drizzle over bars.